In accordance with the State Water Resources Control Board’s (SWRCB’s) Recycled Water Policy, the Upper Santa Clara River Integrated Regional Water Management Group (IRWMG), which is comprised of Castaic Lake Water Agency (CLWA), City of Santa Clarita, CLWA Santa Clarita Water Division (SCWD), Los Angeles County Flood Control District (LACFCD), Newhall County Water District (NCWD), San Gabriel & Lower Los Angeles Rivers and Mountains Conservancy, Santa Clarita Valley Sanitation District (SCVSD) and Valencia Water Company (VWC), have entered into a Memorandum of Understanding (MOU) to prepare a Salt and Nutrient Management Plan (SNMP) for the Santa Clara River Valley East Groundwater Subbasin (East Subbasin). 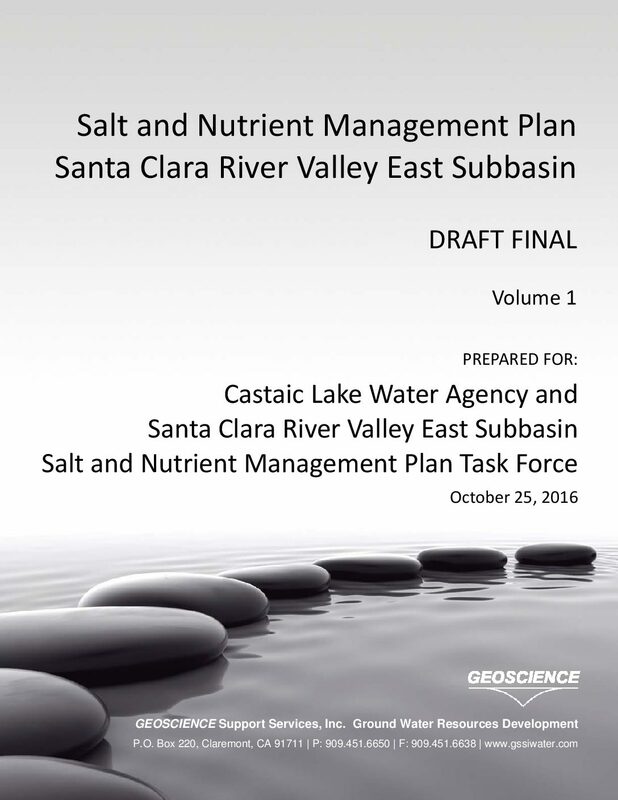 This group of agencies, collectively known as the SNMP Task Force (Task Force) and facilitated by the CLWA, have directed the preparation of this SNMP, which was prepared using guidance set forth by the Los Angeles Regional Water Quality Control Board (LARWQCB). The purpose of this SNMP is to determine the current (ambient) water quality conditions in the East Subbasin and to ensure that all water management practices, including the use of recycled water, are consistent with water quality objectives. This SNMP is intended to provide the framework for water management practices to ensure protection of beneficial uses, and allow for the sustainability of groundwater resources consistent with the Water Quality Control Plan Los Angeles Region (Basin Plan). Additionally, compliance with the California Environmental Quality Act (CEQA) and approval by LARWQCB staff is required. As part of the SNMP, a monitoring plan has been developed for the East Subbasin which identifies key monitoring locations within each subunit for both surface water and groundwater.